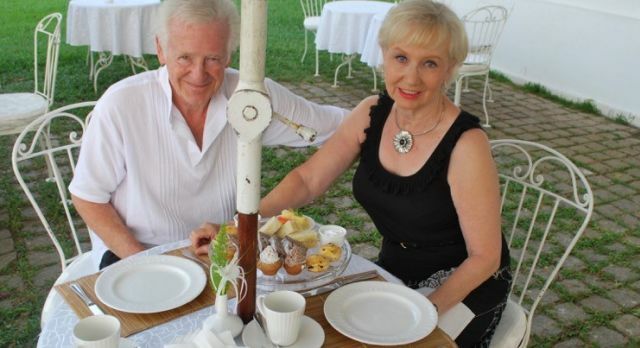 Last October, Don and Else Grimes set out for India to mingle their two favorites – ‘high tea’ and Kerala, where they had visited three years ago. Despite initial apprehensions that things wouldn’t turn out the same the second time around, Don and Else’s visit far exceeded their expectations from their first! Discover some of their personal highlights from their trip to India. 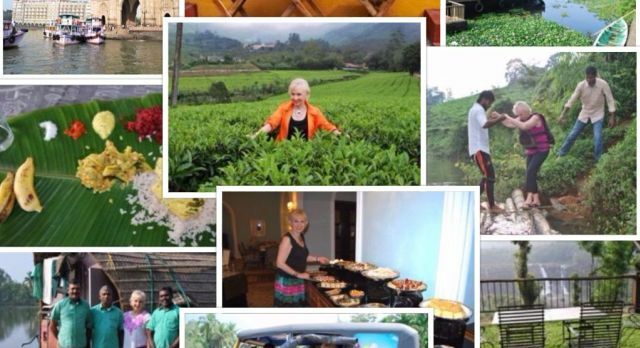 True tea lovers, Don and Else enjoyed several opportunities to sample the varieties that India has to offer – from tea at their guide Vinay’s aunt’s home in Wayanad, to a special High Tea experience in Mumbai, and sharing a cuppa with the Sisters at St. Xavier’s Convent in Pullangady. Recommended: The High Tea Experience at Taj Mahal Palace in Mumbai, where you will find the best selections, setting and service! 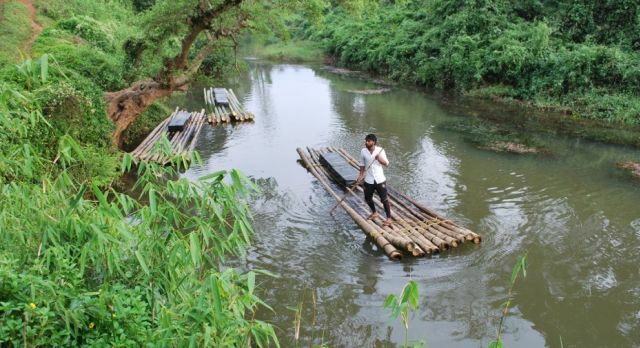 Exploring the river on a bamboo raft in Wayanad! The tents at Grassroots, Wayanad turned out to be a lot of fun! Blanketed deep inside a verdant tropical landscape, surrounded by spice plantations and cheerful birdsong, Wayanad offered a tranquil paradise. Recommended: Nature walks, a visit to meet the local villagers and the banana leaf lunch! Armed with a captain, cook and driver, houseboats sail past quaint local villages through meandering streams of tranquil water. 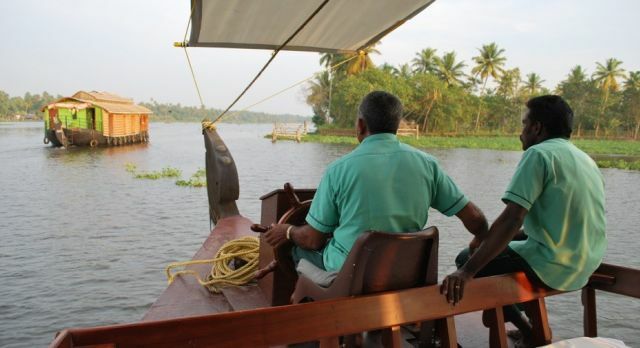 The palm-fringed waterways offer a wonderful glimpse into life by the backwaters of Kerala. Recommended: A visit to Kalloorkad St. Mary’s Basilica in Champakulam. This is ideal for travelers who can also visit the adjoining St. Thomas Fine Arts – a wood carving studio. We are offered a ride! At the end of a perfect day! Easily the unofficial hallmark of Cochin’s beautiful backwaters, the giant Chinese fishing nets that grace Fort Kochi’s shore are perhaps the most popular sight in the area. These nets provide most of fresh seafood Cochin is famous for. 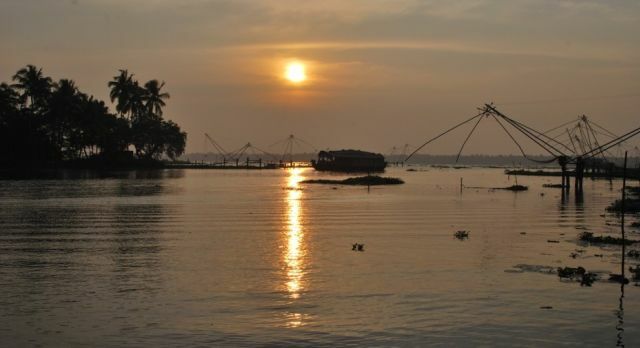 Recommended: Discover the highlights of Cochin, which include the busy harbor area, crumbling remnants of the Portuguese and British era, the famous Jewish Quarter, bustling spice markets and of course, the Chinese fishing nets. Contact us to plan your very own private and tailor-made tea adventure like Don & Else. This blog is a beautiful way to share your experience! Thank you for sharing your photos and itinerary!